After about two weeks of watching Punchy go for his daily ride, I made arrangements through one of his drivers to meet him. I explained to Punchy that I practiced an ancient art called Hands on Healing. I explained about Touch for Health, Acupressure, Tsubo Therapy, Shiastsu Therapy, Jin Shin Do, Massage Therapy and Meditation Healing using sounds and colors. We talked about ChÕi and the circulation of energy, chakras, stretching as well as other kinds of physical therapy and exercise. I looked into his eyes and told him I'd like to try to help him. Although he had never heard of such things and was unable to hide his skepticism, he agreed. Were the doctors with their professional diagnosis correct in their approach? Or was Punchy -- a young man, who had so much energy inside himself Ñ being sentenced to a wheel chair for the rest of his life? Is it true that the solution (if there is a solution) to any problem lies within the problem itself? A breakthrough was needed. 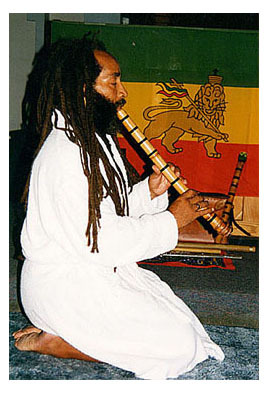 I had recently started conducting meditation sessions with members of our Rastafarian Community in the chapel during which I blow shakuhachi. I asked Punchy to attend. 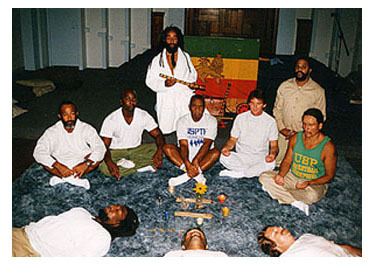 For this special session I gathered together seven men, all physically strong and emotionally and spiritually well-balanced. The seven men would represent the Sun, the Moon, Mother Earth and the Four Directions (North, East, South and West). I explained to them Punchy's condition and what was needed of each man as well as all of them as a collective body. The following is part of a Self-Monitoring Cross-Consciousness account of our first meditation healing session written immediately following the session by Darrell, one of the participants. A wounded Brother was placed on his back in the center of the room. 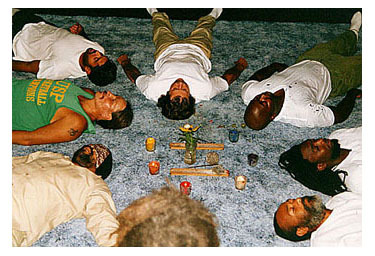 We were instructed to form a circle around him, lying on our backs with our heads nearest to him and focus upon channeling positive energy so that he might be healed. 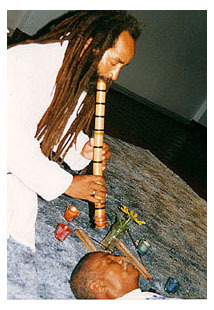 We were instructed to breathe in a rhythmic and harmonious flow, inhaling deeply to the count of five and exhaling deeply to the count of five until we were in perfect unison. 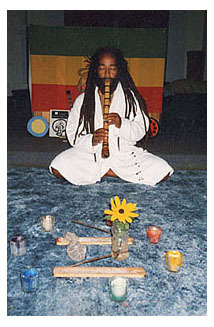 A flute began to play. With my eyes closed, I can hear the melody uttering words of transient delight, making it hard to resist complete relaxation. I have given myself totally to the Wounded One. There was a light. I used it to focus on as I attempted to channel my energy towards the Wounded One. I concentrated on the lower half of his body, for he was unable to walk. the light was drawing near and growing dim, the musical sounds freeing me from anxiety. The light now, ever so near and dimmer still, as the sounds of winds from the flute hovered over my body. I am conscious as my body releases the tension from the controlled breathing and begins to act upon its own to recover its natural pace.The hollow sounds of beauty making me ever so comfortable as the dimness of the light slowly turn to a red. The flute players is standing over me. I am aware of his presence, but why am I moaning? Why can I not respond to acknowledge him? Where am I? Can I help my wounded Brother, and who and where are the drummers? My body won't respond, but I am conscious. I can hear everything and the breaths of everyone; we are all breathing out of time. Everyone has lost the rhythm except the flutist. He has acted as a tour guide down the pathway of total redness., almost leading me towards serenity, if it weren't for the pain. What pain? Whose pain? So much pain, but why am I still moaning? Where am I? 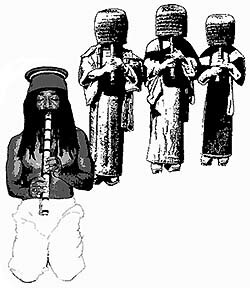 It appears that I have allowed the flutist, the tour guide, to take me beyond the realms of my control. I can sense serenity, but the pain Oh! The pain! And why do I feel as if I'm not alone. The corridor, or pathway, which has turned blue some time ago is now glowing and has a strange aura. The silence broke. Rub your hands together. It was the familiar voice of the tour guide, and I made motions with my hands, which was all I could do to make him aware that the command had been heard. I didn't quite know how to function, for I was distant, incoherent and a slight bit delirious; but I could sense that he knew, for I was still trapped in space. Rub your hands together so that they generate energy, and then rub the warmth over your face wash your face with energy. I was able to comprehend the fact that this was, no doubt, a command, and I found myself obedient, my body began to respond, my eyes opened it was over. After the session had ended and everyone else had returned to this plane, Punchy was still out. When he finally awoke, he blurted out, What happened? Where I been? Everyone laughed. For subscription information contact John Einarsen, Kyoto Journal, 35, Minami Goshomachi Okazaki, Sakyo-ku Kyoto Japan 606, Tel. : 01181-075-771-6111.